Since the dawn of the MTV era, celebrities have made cameo appearances in music videos. Of course, adding a famous face to your video in the '80s most likely boosted its chance to be played more often on the 24-hour music channel. However, sometimes I think the reason that movie stars chose to do cameo roles in videos was to just mingle in the rock-n-roll lifestyle. Even now after the death of MTV as we know it, movie stars like Johnny Depp and Robert Downey, Jr. still try to dabble in the music industry. But for whatever the reason, those celebrity cameos became a fun part of MTV for several years. Now before we rediscover some music videos, let me first define what exactly I mean by a cameo role so you won't be confused. I'm not talking about those early sightings of celebrities before they were famous like Courtney Cox being pulled up on stage in "Dancing in the Dark", Mythbusters' Adam Savage in "You're Only Human (Second Wind)" or Patrick Swayze in "Rosanna." What I refer to as cameo appearances are those instances where celebrities are essentially hired to portray a role or playing themselves for no other practical reason than because of their famous face. 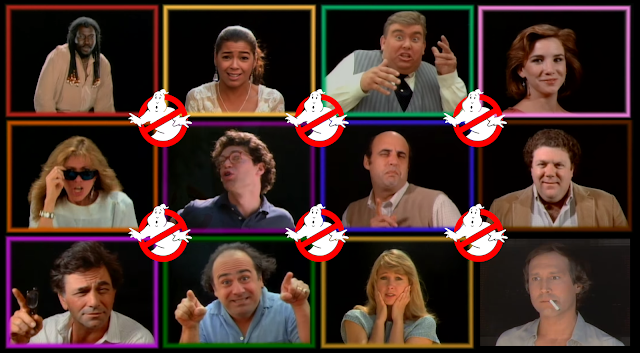 The prime example is the dozen people put in the "Ghostbusters" music video that were just there to scream the answer to "who you gonna call?" into the camera. The list shows the artist/song in bold followed by the (celebrities who appeared in parentheses.) Most of the videos are in the YouTube playlist below. I hope you'll enjoy rediscovering these videos as much as I did!